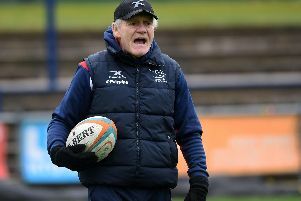 Doncaster Knights overcame the loss of skipper Michael Hills with a knee ligament injury to claim a 28-17 Championship win over Hartpury at Castle Park. But director of rugby Clive Griffiths missed the game after being taken ill the previous night. Head coach Glen Kenworthy said he understood that the Welshman was due to have some tests over the weekend. Reflecting on a first half which ended with the visitors leading 17-6 Kenworthy said: “I thought that we had control of the territory and possession for long periods. “The opposition are always going to have a purple patch at some stage and they scored two close range tries but I thought the boys generally defended extremely well and we could easily have gone in at half-time 6-3 up. “We didn’t have a go at the boys during half-time because, as I say, we had played some good stuff and we just told them to be a bit more clinical and that we had to score first. “We also wanted them to stick to the game plan and I was particularly pleased with the way we controlled and managed the second half and we scored three tries without reply. The New Zealander admits that there are still things to work on but says the side will travel down to Richmond at the weekend in good spirits.